Home » Medical Marijuana Blog » Health » Healthy Cannabis: How Can You Be Sure? Healthy Cannabis: How Can You Be Sure? While federal regulations help ensure the consistency and quality of our food and pharmaceuticals, marijuana’s continued status as a Schedule 1 illegal substance keeps it from the protection and oversight offered to other consumer products. 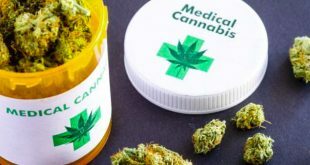 Despite the fact that marijuana is now legal in some form in 23 states (and in our nation’s capitol, the District of Columbia) and is often obtained through a doctor’s prescription, there is little the average person can do to ensure their cannabis is healthy and limited data available about the profile of a given cannabis strain. Each state is responsible for defining its regulations and requirements surrounding cannabis testing, from the plant to a produced product. But without guidance from the federal agencies that set the standards for consumer safety, what has resulted is a fragmented and disjointed (pun intended) system that is, despite the best intentions, failing the very people it’s trying to protect. New Mexico can’t meet the demand for testing laboratories. Colorado has had more than a dozen recalls of products contaminated with pesticides in the latter quarter of 2015, despite having testing guidelines in place. What the labs are testing for, how they’re testing, and what information is provided to the end patient/consumer is inconsistent at best and unreliable at worst. As the industry grows and matures, testing requirements and oversight will undoubtedly improve. But that will take time, and leaves the individual with very limited data about their cannabis. Perhaps it will be labeled as organic, but has that been verified? And while THC levels are often provided, a broader cannabinoid and terpene profile rarely is. As we learn more about the different effects various cannabinoids and terpenes can deliver, people will be looking for specific strains that can target a feeling or a condition. Where do they turn to find what will work best for them? Each state is responsible for defining its regulations and requirements without Federal guidance. Information provided to patients is unreliable. Commercial, independent testing is one solution. But aside from its challenges and growing pains, for most it’s simply too expensive, inconvenient and doesn’t provide immediate results. An alternative to cannabis testing labs is now available that can put the power of a lab into the hands of the people, helping growers and consumers alike directly test and verify the chemical profile of their cannabis. Meet MyDx, the world’s first portable cannabis testing platform. 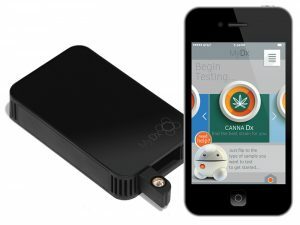 MyDx lets anyone test a sample of cannabis with an analyzer fitted with a specialized sensor that identifies the compounds within that strain. The result is a Total Canna Profile™ (TCP) with a comprehensive cannabinoid and terpene panel, delivered via the CannaDx app. MyDx uses electronic nose nanotechnology to ‘sniff out’ chemicals in nearly any solid, liquid or gas form. 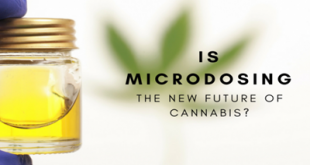 When presented with a sample of cannabis, MyDx will deliver a strain analysis revealing the abundance of medically-relevant cannabinoids and terpenes, whose ratios have been shown to play a key role in how a specific strain makes people feel. Using the CannaDx app, people can then track how that strain makes them feel or what it helps them relieve and hone in on which strains work best for them. For most people, anecdotal feedback or trial-and-error are the only options. The CannaDx app will be fueled by scientific data, delivering insights and recommendations that will help individuals, growers and the industry at large make better decisions and produce healthier products. As the number of marijuana growers, dispensaries, products and consumers continues to explode, testing must play an important role in ensuring the quality and efficacy of a given strain. While more regulation and oversight is on the way, control and confidence must rest firmly on the shoulders of the individuals who are striving to produce and consume high-quality, healthy cannabis. For more information about MyDx and its CannaDx cannabis testing platform, visit cdxlife.com. 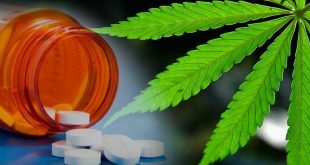 Next Why are patients resorting to utilize medical cannabidiol?